With over 30 years in the industry at Ashford Cleaning Contractors Limited we offer a wide range of cleaning services for industrial and commercial clients. At Ashford Cleaning Contractors Limited our specialist team of cleaners use the latest equipment to provide a high quality floor and carpet cleaning service. 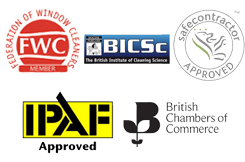 We provide professional window cleaning services to a huge number of very prestigious clients in and around the Ashford Area. At Ashford Cleaning Contractors Limited we provide complete office cleaning service to our commercial clients. At Ashford Cleaning Contractors Ashford we are fully insured to work with ladders, access towers, scissors lifts, cradles and access booms. Ashford Cleaning Contractors Limited was formed in 1979 as a one man window and floor cleaning operation by my father John Lloyd. Through his hard work, reliability, and extremely high standards the business quickly expanded and soon specialised in all aspects of the cleaning industry. The knowledge and experience gained through the years ensures that the best possible services, products and advice are consistently provided to all customers. I joined forces with my Father in 1999 though have been helping him out since I was a child. In January 2005, John Lloyd retired, leaving me and my team of friendly, enthusiastic and dedicated managers, supervisors and approximately 80 cleaning operatives to carry the business forward. Around this time we also purchased, and developed brand new offices, warehouse and storage space at Henwood Industrial Estate, and it is from here that we operate and run our fleet of vans and managers vehicles. We are now one of Ashford’s leading Industrial and Commercial Cleaning service providers, supplying a huge range of cleaning services, goods, products and advice to many of Ashford’s most prestigious companies.Being a local, caring company, we are able to offer an extremely high quality, reliable, responsive, service tailor made to suit the needs of each individual customer at very realistic prices. We also have the flexibility to modify our services to meet the changing requirements of a growing company, or to trim our services to help and support a company during difficult times. We have provided cleaning services to some of our customers for 30 years, proof that we are totally dedicated to making sure we maintain the highest possible standards at all times and guarantee that we are able to provide cleaning services to our customers on a long term basis.Why not give us a call and allow us to provide you with a refreshingly new and enthusiastic approach to your cleaning requirements.